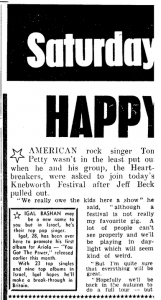 American rock singer Tom Petty wasn't in the least put out when he and his group, the Heartbreakers, were asked asked to join today's Knebworth Festival after Jeff Beck pulled out. 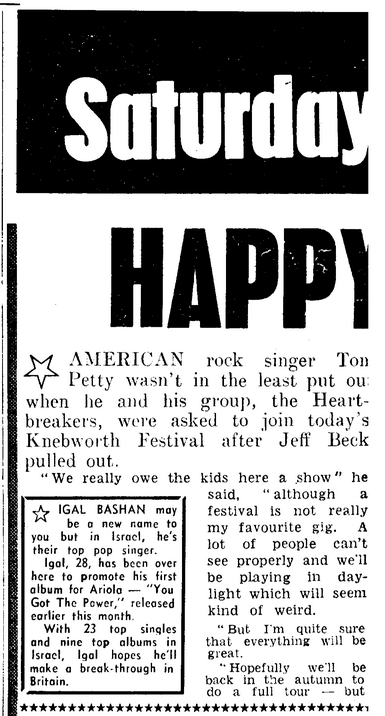 "We really owe the kids here a show," he said, "Although a festival is not really my favorite gig. A lot of people can't see properly and we'll be playing in daylight which will seem kind of weird. "But I'm quite sure that everything will be great. "Hopefully we'll be back in the autumn to do a full tour -- but nothing is definite yet." 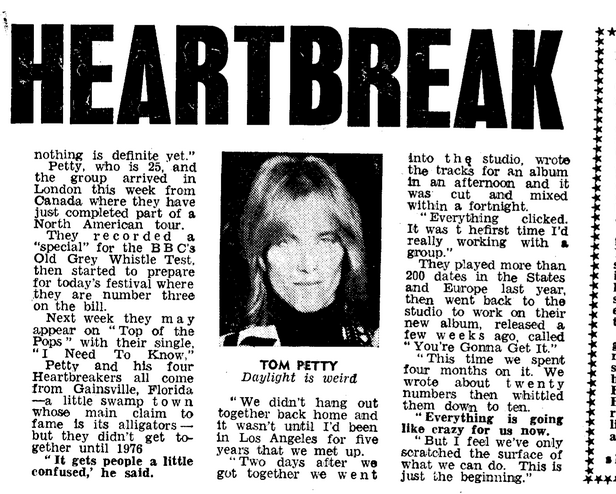 Petty, who is 25, and the group arrived in London this week from Canada where they have just completed part of a North American tour. They recorded a "special" for the BBC's Old Grey Whistle Test, then started to prepare for today's festival where they are number three on the bill. Next week they may appear on "Top of the Pops" with their single, "I Need To Know." 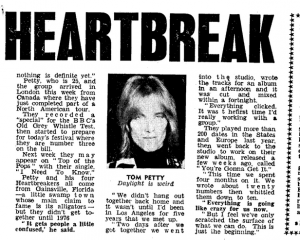 Petty and his four Heartbreakers all come from Gainesville, Florida -- a little swamp town whose main claim to fame is its alligators -- but they didn't get together until 1976. "It gets people a little confused," he said. "We didn't hang around together back home and it wasn't until I'd been in Los Angeles for five years that we met up. "Two days after we got together we went into the studio, wrote the tracks for an album in an afternoon and it was cut and mixed within a fortnight. "Everything clicked. It was the first time I'd really working with a group." They played more than 200 dates in the States and Europe last year, then went back to the studio to work on their new album, released a few weeks ago, called "You're Gonna Get It." "This time we spent four months on it. We wrote about twenty numbers then whittled them down to ten. "Everything is going like crazy for us now. "But I feel we've only scratched the surface of what we can do. This is just the beginning."